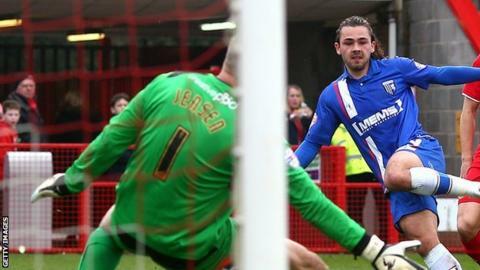 Gillingham manager Justin Edinburgh has insisted that Bradley Dack has no interest in joining Bristol City. The Championship club have had three bids for the 22-year-old Gills midfielder rejected. And Edinburgh told BBC Radio Kent: "I spoke to Bradley and he made it quite clear he didn't feel that Bristol was the right move for him at this present time, which I was delighted with. "He just wants to have success here with Gillingham right now." City were told their bids were short of Gillingham's valuation before the Robins did secure the signing of a midfielder - QPR's Ben Gladwin on a three-month loan deal. Gillingham, currently third in League One, were reportedly offered £1m for Dack, who has scored 13 goals this season. But Edinburgh is convinced the former Charlton youngster is worth substantially more than that figure. "Our valuation is a long way off that," he said. "With 13 goals and 12 assists, I don't think there's a more valuable player in the league."